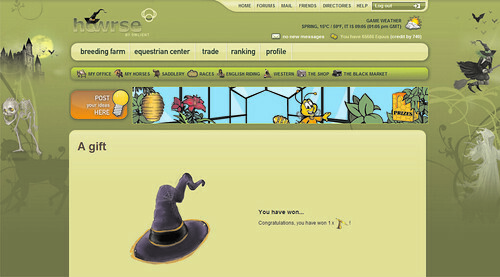 Howrse also allows you to get a ghost horse by buying 10 or more passes.This means you will get one ghost horse UFO automatically after 0ne pack (10) passes. If you buy two packs, making it 20 passes, you will receive two ghost horse UFOs. You will still have the chance to find one floating around like the other UFOs even if you don’t buy passes. Did you catch a UFO? Which prize did you get? http://www.howrsehelper.com, how do you do it? i got a made-to-measure saddle caght buy a yellow sweet! I wonder if they are going to decorate the site up this year.